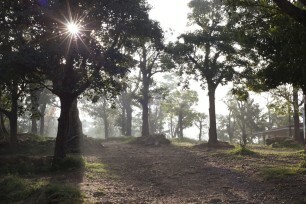 The entire Nelliyampathy hills originally belonged to the Vengunad Kovilakam of Kollengode (a principality), who had leased out vast tracts of this virgin forest area to the Government during the 19th century. Some tracts of the Nelliyampathy hills were leased out in the year 1889 to two Britons – Arthur Hall and W.R.M. McKenzie – who initially opened up the land for commercial cultivation. Later, in 1896 they sold the leasehold right over the land to a Finlays enterprise – The Amalgamated Tea Estates Company Ltd formed by John Muir, which was subsequently acquired by The Amalgamated Coffee Estate Pvt. Ltd.The Amalgamated Tea Estates Company Ltd., received a Gold Medal at the Paris Exhibition held in 1900. The estate was later sold in different portions to various parties. In 1988, one such portion then held by Karuna Plantations Pvt. Ltd., was transferred to the Poabs Group and since 1989, the plantation has been developed entirely by Poabs. The estate, initially planted with arabica coffee with inter-crops of cardamom, has come to be known as ‘Seethargundu’, the name being associated with the epic story of Ramayana; “SEETHADEVI lived here with Sreeraman during the Vanavasa period (Exile Period)”. The estate has variously been called “Seethagundy”, “Seethagandy”, “Sethangandy”, “Sitakundu”, as often happens with local names. When the Poabs Group took over in 1989, the Seethargundu estate was in a derelict condition, existing practically in an abandoned state for some 16 years. The previous neglect of the estate was taken as a blessing in disguise, as this had in effect allowed the land to lie fallow, laying the ground for organic farming. A key step forward in the rejuvenation process involved replanting: old plant material was replaced with improved varietals of coffee, cardamom and pepper. Tea planting was done afresh to bring in an additional crop – creating in the process the first such large-scale tea plantation established since the colonial era, furthermore, under entirely organic systems. The initial years were spent in designing and adopting good soil conservation and water harvesting techniques. 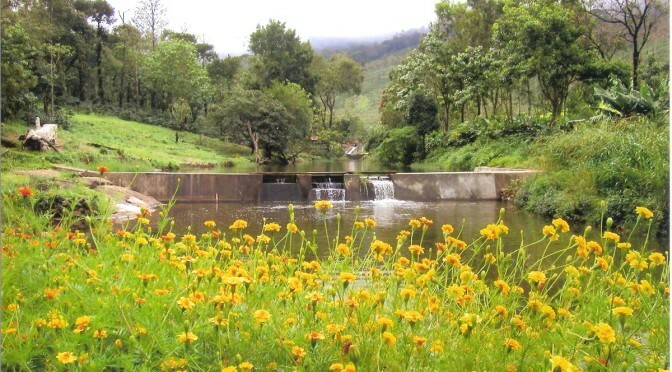 Check dams were constructed to conserve water for the summer months, and eco clubs established for knowledge sharing. A fresh trajectory came about in the year 2000, when Poabs Estates took a strategic decision to adopt Biodynamic practices. Biodynamic agriculture requires a holistic approach that is now recognized as a variant of organic farming. The Tea Factory, Coffee Pulping unit for washed coffees, Pepper Mill and Freeze-Drying facilities were made operational in phases. After 25 years under the present management, the estates arevisibly transformed -and now yield a variety of organic produce in demand in the international markets. Poabs Organic Estates is today recognised as the “largest perennial multi-crop organic farm in the world” and is acknowledged in international organic farming circles, as a project that is a ‘Global Model’. (Image) A picnic group in the Nelliyampathies in the 1880s. The Halls, perhaps the best known of the early planters in the Nellies, always held that there were others before them in these hills where only tribals roamed before the land was opened up by the planters. By the time Arthur Hall arrived in the Nellies in 1877, there appeared to have been coffee planted without shade in what were later known as Shernelly, halfway up the ghat, and Nelikolam Estates, the latter on the plateau. Arthur Hall started planting at Cotengady, near Padagiri, and was the father of planting in the Nellies. 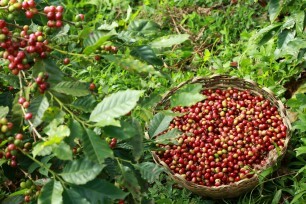 By the 1890s, there were over a hundred European planters in the district, mostly from the coffee districts of Mysore, but by the 1930s there were no more than half a dozen and most of the coffee they had planted lay abandoned… The Halls’ property and James Finlay’s at Sethangandy (Seethargundu) were two that were still flourishing at the time… Both older estates also planted cardamom and a visitor to Sethangandy said its cardamom were “the biggest and best he’d ever seen”. In the hills, planters built roads and used bullock carts, which had been carried up and assembled there. But all traffic out of, and into, the district was by head load, pack bull and horse till 1932 when the Nemmara road was opened. The Nellies in those days was good animal country. Elephants could be met round the corner on the narrow twisty interior roads, so going out after dark meant being careful. Bison and tahr provided good shooting- sixteen-incher tahrs common in those days. It is also a matter of record that two of the very few man-eaters ever found in South India were in the Nelliyampathies, operating on the jungle track to Nemmara. The Nelliyampathies have got back to the serious business of planting since then – and it’s been a far more successful business than in the days when the Halls alone appeared to have faith in these hills. Excerpts from the book: A Planting Century – 1893-1993 – The first hundred years of The United Planters’ Association of Southern India by S. Muthiah. ©UPASI – S. Muthiah, 1993. Reprinted with the kind permission of UPASI.